In 2015, at the World Summit on Sustainable Development under the auspices of the United Nations in New York, Member States formally adopted the 2030 Agenda for Sustainable Development. This agenda provides for 17 goals, including a new global goal education (SDG 4). This goal is to provide inclusive and equitable quality education and promote lifelong learning opportunities for all. 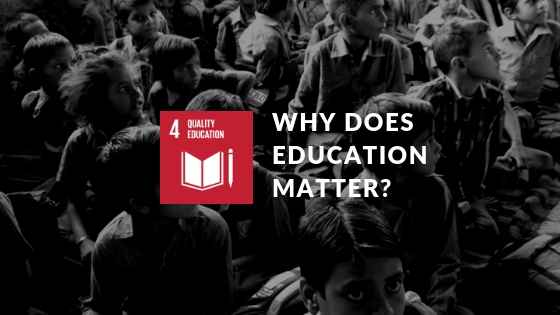 Education is a key element that will achieve many other sustainable development goals (SDGs). If people have the opportunity to receive a quality education, they can break out of the vicious circle of poverty. Extreme poverty is now defined as living on less than $ 1.25 a day. The United Nations Development Program (UNDP) and the Oxford Poverty and Human Development Initiative (OPHI) has been conducting research in 105 countries, where 75% of the world’s population lives, or 5.7 billion people. Experts found that 23.5% of them live below the poverty line. Experts noted that more than half (662 million people) of those who live below the poverty line are minors. The poorest regions in the world are sub-Saharan Africa, where 58% of the population lives in poverty, and South Asia (31%). Therefore, education contributes to reducing inequality and achieving gender equality. Based on data from 114 countries for the period from 1985 to 2005, it was found that one additional year of study corresponds to a 1.4 percentage point reduction in the Gini coefficient. Providing women and girls with equal access to education, health care, decent work and participation in political and economic processes will contribute to the sustainability of the economy and benefit society. Investing in educational programs for girls and increasing the age of marriage will provide an income five times higher than the amount invested. Education also plays an important role in promoting tolerance in human relations and contributes to the formation of more peaceful societies. Have you ever thought that you can make a difference in the world, it starts with that first step and works well as the butterfly effect. If you want to contribute towards the Sustainable Development Goals and tackle the issues you’re most passionate about, find the Opportunities here. International Day of Women and Girls in Science What is FridaysForFuture and why should I care?